So go the lyrics to the folksong, “Low Bridge, Everybody Down,” written in 1905 by Thomas Allen. From the time the Erie Canal was completed and opened, on October 26, 1825, to today, the Erie Canal represents the epitome of American vision, ingenuity and practical capability. The Erie Canal was the brainchild of DeWitt Clinton, a lawyer and politician who served as a New York legislator, senator and governor. Because of his dogged determination to build the canal, the project was called “Clinton’s Ditch” during his day. The project was massive, the biggest public works initiative in the history of the new nation. When completed, it ran 363 miles from the Hudson River at Albany to Lake Erie at Buffalo. Along the way, 83 locks raised the waterway 571 feet from East to West, and 18 aquaducts carried the canal over rivers. The original canal was 40 feet wide and 4 feet deep, accompanied by tow-paths on both shores that allowed teams of mules and horses to pull canal boats along their journeys. Construction began on July 4, 1817 and ended eight years later, as Clinton poured a bucket of Lake Erie water into the ocean at New York. When completed, it was often called the Eighth Wonder of the World. The canal became a symbol of American can-do spirit. The canal had immediate positive results for the nation, and former skeptics shrank into the background. The trip by stagecoach from Albany to Buffalo had taken two weeks of back-breaking travel; by canal, it took five days in relative comfort. More importantly, it opened markets from the Midwest to the country’s eastern seaboard, assuring inexpensive and healthy food supplies and a stable economy for farmers. 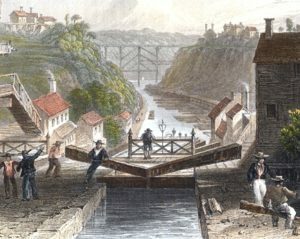 As each section of the canal opened, expansion of commerce followed, mile after mile from Albany westward. Within a few years, the canal reached capacity and needed to be expanded. Between 1836 and 1862, the width was increased to 70 feet and the depth to 7 feet. From 1903 to 1918, the canal was enlarged again and became known as the Erie Barge Canal. The locks were reduced to 36, much deeper and wider than earlier, speeding travel. The canal still operates today, but mostly for recreational boats. What is the conservation message? First, of course, the ability of humans and nature to work together to accomplish meaningful improvements in civilization is the essence of conservation. Second, however and more specifically, the Erie Canal illustrates the importance of water-borne transportation. Moving materials, especially heavy and bulky products like coal, oil, rock and concrete, by water remains the most efficient and safest form of transportation. In terms of greenhouse gases produced per ton of cargo, barge transportation is a bargain compared to railroad and, especially, truck transportation. The US Army Corps of Engineers maintains 12,000 miles of navigable waterways, mostly along the coasts and through the Mississippi and Ohio River valleys. These waterways transport 60% of total grain exports, 22% of petroleum production and 20% of coal used for electricity production. The Erie Canal and its various branches are now featured in a unique National Park Service unit called the Erie Canalway National Heritage Corridor. The corridor, created in 2000, encompasses the entire upstate New York region, specifically highlighting 524 miles of navigable waterways. Erie Canalway. Erie Canalway National Heritage Corridor. National Park Service. Available at: https://eriecanalway.org/. Accessed October 25, 2017. The Erie Canal. “Clinton’s Big Ditch.” Available at: http://www.eriecanal.org/index.html. Accessed October 25, 2017. The Erie Canal. DeWitt Clinton. Available at: http://www.eriecanal.org/UnionCollege/Clinton.html. Accessed October 25, 2017. U.S. Department of Transportation. Waterways: Working for America. Maritime Administration, US DOT. Available at: https://www.marad.dot.gov/wp-content/uploads/pdf/water_works_REV.pdf. Accessed October 25, 2017.